For me this is the classic Pilsner that all others strive to emulate. It’s doesn’t blow your socks off or make your eyes pop out of their sockets – because essentially it is understated perfection. You could quite easily be at a party and drink several glasses without bothering to ask your host what it is – that’s part of it’s charm for me. It’s not trying to be loud or crazy or over complicated or get in the way – it’s just being itself. Salt of the earth and genuine! However when you tire of all the wacky hop busting peacock juice and settle down in a sun blessed deck chair for some quiet reflective relaxation – and you pop the top off the trusty bottle and pour the perfect golden beer into a well selected pilsner glass – you sigh will eternal happiness. Then you sip and you smile even more – comforted by the consistency of the perfect balance of sweet malt and saaz hoppy bitterness. It’s not too carbonated either – again perfectly balanced with just enough crispness with a light head. 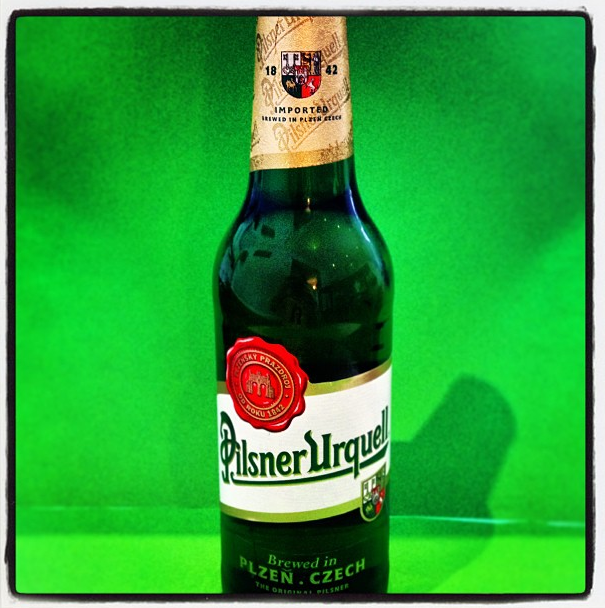 The recipe for Pilsner Urquell remains the same as it did in 1839 when, frustrated at the quality of beer served in local inns, brewers in the town of Pilsen, Czech Republic got together to combine their knowledge and skills to make a better tasting beer. A young architect named Martin Stelzer was enlisted to build the Burgher’s Brewery, a forerunner to the present day brewing company. He invited visionary Bavarian brew master, Josef Groll, to join in the crusade and, fuelled by passion and a desire to create something truly remarkable, they created the first batch of Pilsner on 10th November 1842.